Melanie Oudin will likely be the No. 1 singles player against Germany. 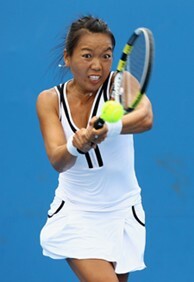 Vania King replaces Bethanie Mattek-Sands on the U.S. team. Christina McHale will be playing in her second Fed Cup tie. STUTTGART, Germany - The U.S. Fed Cup Team has been the underdog for almost every tie it has played in Mary Joe Fernandez’s two-year tenure as captain, and they have played away in five of those eight ties. So to play that role against Germany in Stuttgart April 16-17 in the World Group Playoffs is something each of the team’s players – Melanie Oudin, Christina McHale, Liezel Huber and Vania King – is used to, and each knows how to handle the situation of playing against a hostile crowd and how to handle the big moments and pressures that come with representing one’s country. This U.S. team will, however, be playing in a new situation of fighting for its spot in the eight-team World Group for 2012, after being forced into a World Group Playoff for just the third time in U.S. Fed Cup history after falling to Belgium in the 2011 quarterfinals in February. The Americans do not feel any added pressure – just the usual that comes with playing as part of a team and for the U.S.
"We always feel pressure in Fed Cup. When you are on a team and representing your country, it is a feeling like no other," Fernandez said. "You feel that more is riding on your shoulders each time. I think it is the third time we are in this position to (try to) stay in the World Group and the first time that we are away (to do it), so it makes it more challenging. But we play every match and we do our best, and hopefully we can come out with three victories." King was a late addition to the team this week after Bethanie Mattek-Sands was forced to withdraw from the tie after injuring her hip last week at the Family Circle Cup in Charleston. She was also on the roster for the U.S.’s quarterfinal tie against Belgium, along with Oudin and Huber. Venus Williams will also be in attendance this weekend to support the U.S. team but is not expected to compete. She has not played since retiring from her third-round match at the Australian Open – against Andrea Petkovic – with a hip injury, which she is still recovering from. They will face a talented German team of world No. 19 Petkovic, who is having a career year, No. 34 Julia Goerges and former top-25 players Sabine Lisicki and Anna-Lena Groenefeld, whose rankings have fallen recently because of various injuries that have kept them off the court. It will not be an easy task away on an indoor red clay surface, but make no mistake, the Americans will fight for every point and each match, and the German team is well aware of it and doing its best to learn as much as it can about the young Americans. "They have quite a few really good young players with McHale and Oudin, and they are still very, very dangerous," German Captain Barbara Rittner said of the U.S. squad without Mattek-Sands. "We know that, and my players have lost to some of them, and we have a lot of respect for the U.S. team. Mary Joe is a very good team captain with a lot of experience. We take it very seriously, match by match. We will see how it goes." Petkovic, who reached the quarterfinals of the Australian Open and recently the semifinals at the Sony Ericsson Open, has been studying up on her American opponents. She faced Oudin just once back in 2007, has never played McHale and played King for the first time last year, which she won in three sets. "I have prepared myself quite well. I went to YouTube today and watched a lot of matches," Petkovic said. "I tried to figure out strengths and weaknesses (of each player) and try to put together a game plan for the weekend. Of course, now some things have changed (without Mattek-Sands). Probably Oudin and McHale will play singles, I am not sure. You never know. I think we are well prepared. Barbara has a lot of experience, and she has a good strategic mind. She knows what she is talking about, and I’m sure she will also watch some YouTube in the coming days. "I am very excited because it is always very interesting and exciting, playing young players who are still hungry for victories and very patriotic about playing for their countries. I am very excited. It is going to be a big fight, I’m sure," she added. Two players who are familiar with each other are Oudin and Goerges, who met in the first round in Miami, which was a straight-sets win for the American. They both learned about the type of game style they each like to play, which they will pass along to their teammates, although the situation is very different with the match in Germany on clay instead of in the U.S. on a hard court. "I played a really good match against her in Miami," Oudin said of Goerges. "Of course, this is different. That was in the States, which was better for me. The crowd was for me there, and here they will be against me. But I think it is good I have gotten to play her recently. Then if Christina or Vania plays her, I will give them some good tips. But it will be different. It is a different surface, and red clay is a lot different than hardcourt, but hopefully it will be good this weekend." Fernandez and Rittner will announce their lineups for this weekend’s tie at the official draw ceremony on Friday. Both captains have multiple options for both singles and doubles. Oudin, King and McHale can all play singles for the U.S.
McHale is off to the best season of her career and reached a career-high ranking of No. 82 this week, one spot behind Oudin. She advanced to the quarterfinals in Charleston and the third round in Indian Wells. She also has one Fed Cup match on her resume, having played last year in the team’s quarterfinal win over France. "I feel like I am at a good point now in my game," McHale, 18, said. "I am trying to get used to the conditions here. I have not played any of the German players, if Mary Joe picks me to play this weekend. But I am just going to keep practicing and working hard this week, and we’ll see how it goes." Should the tie come down to the final doubles rubber on Sunday, the U.S. team looks to have the advantage with Huber, the world No. 3 in doubles, and King, the world No. 6, ready to go. They paired together to win the U.S.’s only point against Belgium in February.